Babes Ride Out is a true riding event which means when the sun comes up, grab a coffee, some breakfast at camp, and get outta there and explore some of the best riding in Southern California. We aren't joking when we say the camp clears out during the day. If you stay behind, you are blowing it! Stop by the Mojave Land Trust booth , pick up your Biltwell route map, and make sure to download these directions before you go. 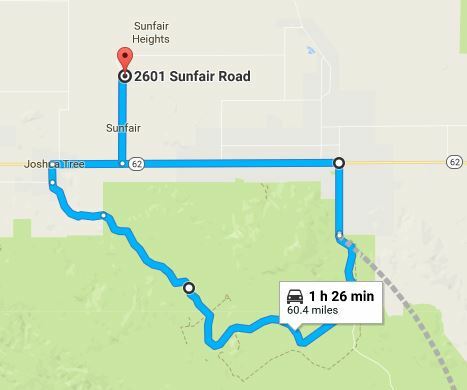 One of the most scenic and MUST see routes is the Joshua Tree Loop which takes you down long slightly curved roads through the park. Heads up, there is a $25 fee per motorcycle to enter the park but it's good for a full week. You could easily spend an entire day in the park so make sure to pull over in their designated parking areas and look at the map. Jumbo Rocks, Skull Rock, and the Chollo Cactus Gardens are a must see! $12 per moto, pass good for 7 days. Want to ride in and rock climb? Sign up HERE to get a guided climb with Cliffhanger Guides! Vegan or vegetarian? Makes sure to eat at Natural Sisters or Crossroads. They are the best! You are riding at your own risk so please make sure you view the route & mark your gas stops based on tank size, check the local weather where you are going, check for last minute road closures, and have the skill set to ride comfortably.